The BODPOD provides valuable feedback for monitoring the effectiveness of fitness and nutrition programs. It is a quick, safe and noninvasive way to measure body composition with the results being highly accurate and repeatable. The BODPOD can detect small changes in both fat and fat free mass. The feedback you receive can help monitor for obesity, a major risk factor associated with many diseases. It can also help you gain or lose body fat safely, or fine tune athletic performance. 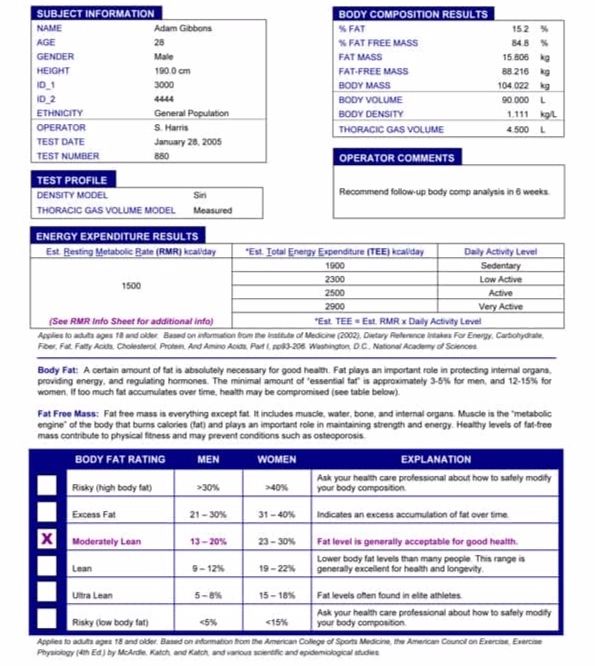 An accurate body composition analysis can provide a baseline measurement of your current body composition or monitor progress on your current fitness, nutritional or lifestyle change. We would be more than happy to answer any questions you may have. Contact Us to set up a time, for large group/organization testing or for any question you may have. You can select an opening on the schedule. Click the “BODPOD” tab at the top to see only those sessions. The test takes less than 5 minutes. You will actually be sitting in the BODPOD for 2 to 3, 50 second intervals. What do I need to wear. During the test, you will need to be in a spandex or lycra bottom and top (if applicable) and wear a swim cap (provided). The attire should be thin and unpadded. What do I need to do to get ready for the test? You will need to be fasted and at a stable body temperature. We try and schedule testing for the first thing in the morning, before any food, drink or exercise. This will ensure test to test variability is low. We currently offer testing on Thursday and Saturday mornings. Check out our schedule tab for openings. If you have a large group that you would like tested, contact us and we will set something up just for you. You can see a sample of the printout you’ll receive after each individual test (left). If you test with us multiple times, you can track the changes on one printout (right).